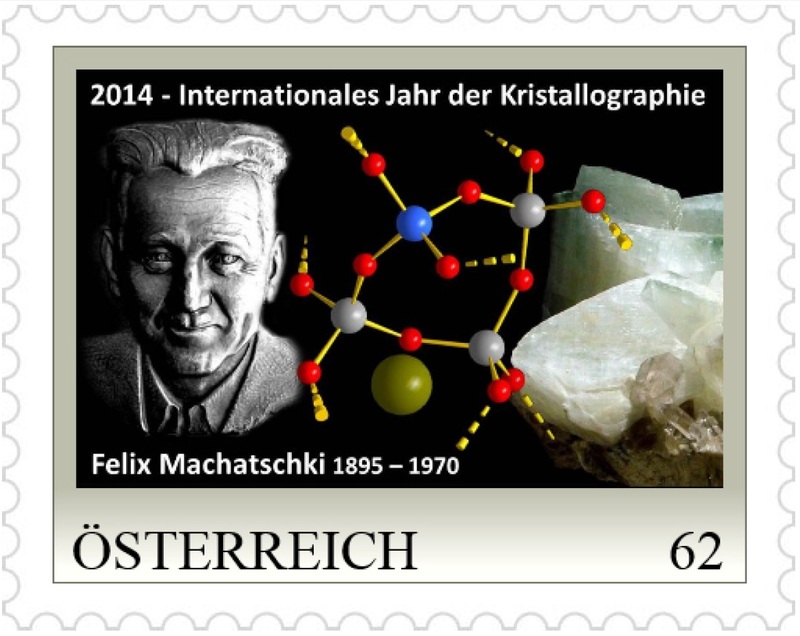 On the occasion of the "International Year of Crystallography" a postage stamp was printed in Austria to honour the mineralogist and crystallographer Felix Machatschki (1895-1970), who died 44 years ago. He was the first to describe the principle of the arrangement of atoms in the crystal structure of feldspars and other silicates, i.e. the most common minerals in the Earth’s crust. In the course of his very productive career at the Universities of Graz, Oslo and Manchester (where he worked with luminaries V. M. Goldschmidt and W. L. Bragg respectively), Göttingen, Tübingen, Munich and Vienna, he greatly advanced our knowledge of isomorphism, crystal chemistry and structure of silicates, for which he received numerous honours and awards, inter alia the Roebling Medal of the Mineralogical Society of America. As one of the outstanding scientists from the early period of crystal structure determination by X-ray diffraction, he stands at the beginning of a great tradition of this science in Austria and had major influence on its development in the whole world. The stamp shows a picture of Felix Machatschki, along with a nice feldspar crystal (adularia from East Tyrol) and a section of its crystal structure, relating to his scientific work on these minerals mentioned above. Commemorative envelopes with special postmarks will also be available.